Once in a while everyone becomes so frustrated with something thatthey growl under their breath, "Even I could have designed a better______" (fill in with the object of your wrath). Not to defend the merchants of commerce, but the thought of someoneas technofeeble as myself jumping ahead of engineers, designers, andmarketing executives is bit silly. But there is no harm in visiting afantasy world every once and a while. There are some niggling details which continue to escape me. Forinstance, why can't all cellphone manufacturers standardize their poweradapter plugs. I have five individuals with cellphones in my house thatrequire 4 or 5 different AC wall plugs and DC car chargers. They allget shoved into a drawer and (I swear) start to mate! I know, it's aplot by cunning marketeers who want to sell more and more uselessthings until the planet is hip deep in cellphone car chargers. Automobile diagnostic equipment is another peeve of mine. I used tobe able to fix minor problems with my car. Note that I said usedto. Every manufacturer has its own system and its own diagnosticgear - and won't sell the gear (or even the codes) to independentgarages. I know it's technologically possible to create a digitalinterface in every car sold that would allow the owner to be alerted todiagnostic issues as they occur. Why can't we have that now? I know,dealerships make more money off of repairs than sales. But wouldn't itbe safer if we knew what was going on in that 3,000 pound deathtrapthey sold us? There is no limit to my hubris, so let me go on to design a betterlaptop. In my (not so) humble opinion, there are some issues that wouldseem to make sense. Removable batteries are essential. No matter whatthe battery manufacturers do, batteries eventually wear out. If you canreplace the battery, you're back up and running in no time. If not,you're without your computer. It's also nice to be able to have a sparebattery when you know you're not going to be near an AC line anytimesoon. One of the features that I positively love about my PowerBook G3 Pismo is myability to take the laptop out for the day without having to bringalong my yo-yo AC adapter. This is true wireless computing. I really do prefer the removable module bay in a laptop. Withthis feature, you can add different drives or storage devices thatallow you to increase the laptop's versatility to that of a desktop. Ifthe MacBook Air had aremovable bay, you could even add all the missingconnectivity I complained about. 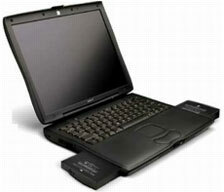 Aftermarket manufacturers couldalso develop devices that could extend the useful life of yourlaptop. I also believe that a PCMCIA/PC Card card slot is a real godsend. Iknow that the MacBook Promodels have ExpressCard/34 slots, but there are still a whole lot ofPCMCIA cards out there. My Pismo has one, and I just bought a USB 2.0card to bring an 8-year-old computer out of the USB 1.1 stone age. Icould use a Compact Flash adapter to add another memory device - oreven run the operating system from it to increase battery life and savesome wear and tear on the hard drive. Laptops are either easy to service or have been designed bytechnical imps from heck who delight in increasingly Byzantineassemblies. Why can't we change out a processor, hard drive, and (moreimportantly nowadays) a video card? Maybe it makes the computer"loosy-goosey" and not as reliable as a less accessible laptop, but I'mnot the only Pismo fanboy. Mine keeps on chugging along as well asother PC and Mac laptops past their prime. "RAM is the Geritol of older computers" - so says my boss. He'sright. So another item on my wish list is upgradable RAM. I don't thinkyou can provide too many RAM slots, but every year brings more and morememory requirements from that fancy pants software we just have tohave. It is retro to suggest that maybe there is a market for a barebones operating system, but that would be another column. In my dreamworld, a better laptop would able to add more RAM in some fashion. Would this be a better laptop? I don't know, but it would probablybe a longer lasting one. I think we can all admit that if we're notcareful, we could be hip deep in old laptops and their power adapters.